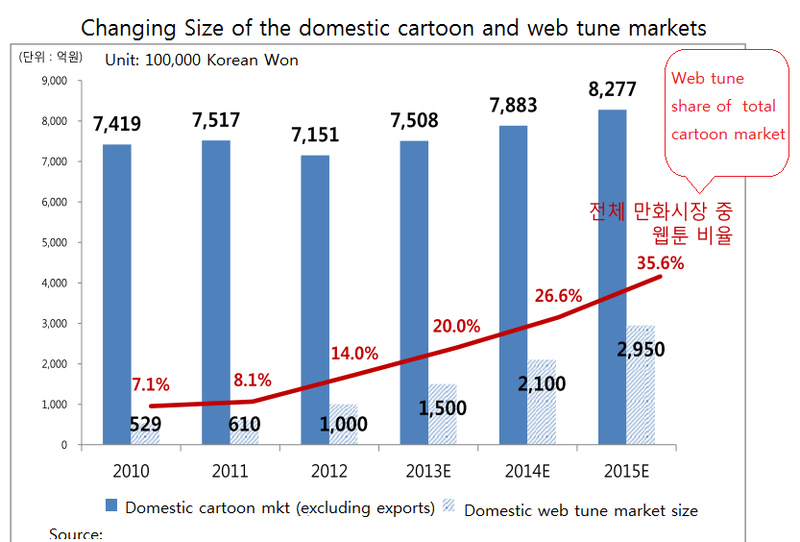 A very interesting article appeared in The Korea Times, indicating the tremendous growth of Korea's domestic webtoons market, following the introduction of smartphones in 2009. The article stated that "Korea’s webtoon market will nearly triple to 295 billion won ($272 million) in 2015 with the wider use of smartphones and other mobile gadgets, compared to 100 billion won in 2012, said a report released by the KT Economic Research Institute." 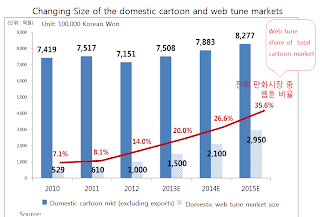 “One out of three Koreans connect to a website showing online cartoons almost on a daily basis, and an increasing number of moviegoers buy tickets for webtoon-based movies,” Kim Jae-pil said in the KT report. The KT Korean language report is accessible at www.digieco.co.kr if you register for membership. It contained the accompanying graphic (click to see a full size version) for which I translated the title and some labels.